Back in the 1980s this well known brand was a common enough sight here but it then faded into the wings. True, a limited number of Fiocchi products have been quietly available through Brook Bank SG and Hull Cartridge Company for some years, but as I say, it has been a limited selection. That’s all set to change now that Fiocchi UK Limited has been formed, a new company headed by Graham Morris, former managing director at Eley Hawk. Graham is importing a full range of clay and game Fiocchi cartridges as well as .22 rimfire and other centrefire and component products to order. This family run Italian manufacturer produces cartridges of excellent quality and performance and has always had good brand awareness. A valliant return to the UK? Fiocchi UK has spent a good deal of time ensuring the product range is suitable for the home market, something that is not always easy with continental manufacturers. Even the packaging is in English, so you do not need to be bilingual to decipher what you are getting on the box. The Italians are prolific cartridge makers with RC and Nobel Sport notable examples of the art. In fact many of our own makers use various Italian components in their cartridges. Even Winchester produce a range of Italian products, if you can get hold of them. So what’s on offer from Fiocchi? In the clay range there are three products including Official Trap which is the top flight competition load in 24 or 28gm with a high antimony content. Prices start at about £142 for 1,000. Next up is the mid range Top Speed at around £131, and the budget range Top One available in plastic or fibre wad starting at around £104. I expect this latter shell to grab significant market share, being of good quality, economically priced in this current age of soaring prices, available in a full range of shot sizes and with that increasingly necessary fibre-wad option. I tried some Official Trap a couple of weekends ago on English Sporting and found them easy on the shoulder but with ample performance to break long targets. With fast burning powder so favoured by Italian manufacturers, this shell gives a muzzle velocity in the region of 1450fps. And with a 5% antimony content it will be man enough to deal with the toughest targets you encounter. A lot of thought has gone in to the game range too. Italians are not noted for their eco-friendly outlook on life and plastic wads are the norm, but the products being imported also encompass a working range of fibre options. With a full range of shot weights from 28gm right up to 52gm fox killers, there should be something to suit all tastes here. There is also an economical Sporting Pigeon 32gm load available in plastic or fibre wad, starting at a very reasonable £131 per 1,000 which could put the cat amongst the proverbials when compared to some of the British offerings. The smaller bores are also well catered for, especially in 20-bore mode. 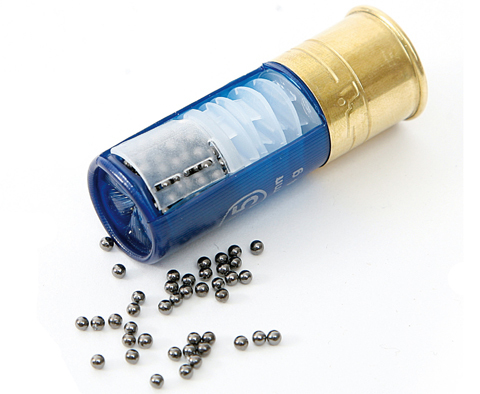 The 28-bore range features a 17 or 24gm load which should prove useful plus a full range of .410 stuff also, encompassing 2in, 2.1/2in and the renowned 3in 19gm load in a full range of shot sizes. These are very competitively priced, starting at around £147 per 1,000 in the shops. And for the garden gun connoisseur, there is also a range of 9mm Flobert ammo for those pesky small vermin. By the time you read this, the full complement of Fiocchi products will be on the shelves, so I could do worse than advise you to get out there and try them. I am impressed by the care and thought that has gone into tailoring these cartridges for the British shooter and I predict they will quickly rebuild a loyal following. This is a well known brand that has been conspicuous by it’s absence for some years, but I get the feeling it is now here to stay. Fiocchi cartridges are available from the Just Cartridges website.